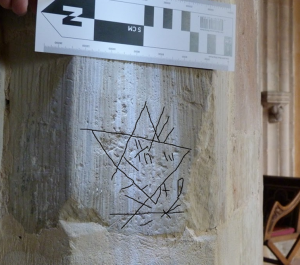 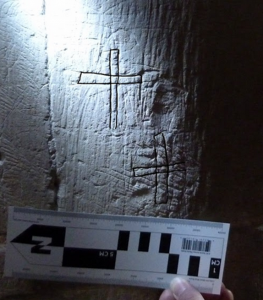 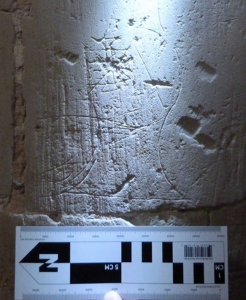 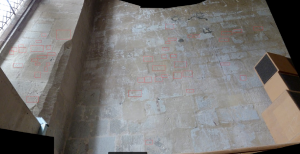 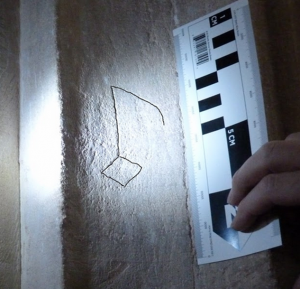 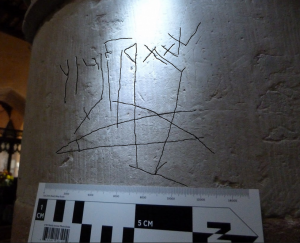 Through the winter of 2016-2017 we have been doing a survey of graffiti in St Michael’s Church. 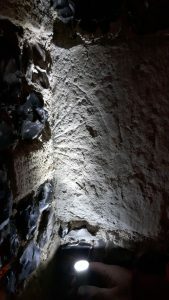 We would like to thank the church authorities and bell ringers for their permission and help in getting access to some area of the church that aren’t always accessible. 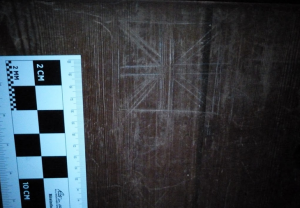 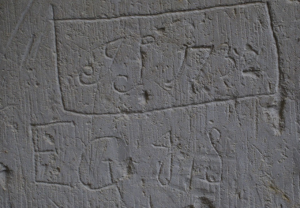 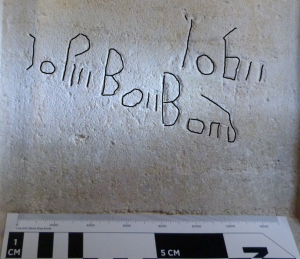 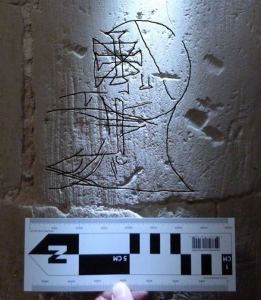 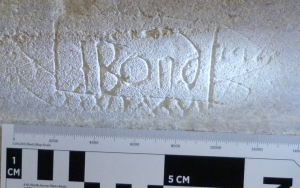 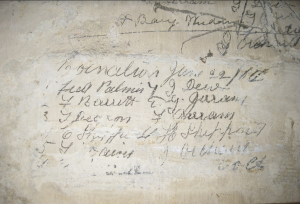 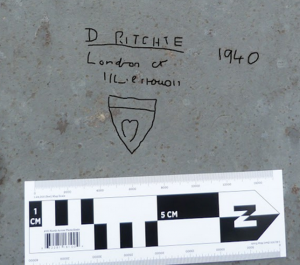 I would also like to thanks Jan Lambourn who helps with finding and recording the graffiti. 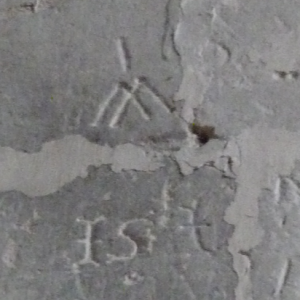 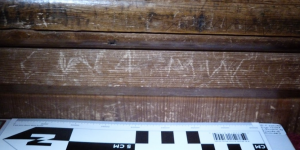 Also sometimes new graffiti appears, I am certain the one below wasn’t in the porch when we first visited, but it is now! 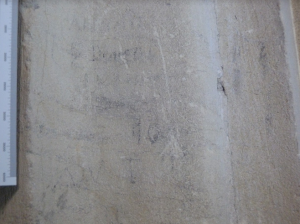 This also goes to demonstrate how unreadable the graffiti can be, so I have doctored a number of the pictures with an electronic marker pen to help show what’s there. That the lettering is partly filled with old limewash attests to it’s age – old enough to have been painted over and then the paint removed again. 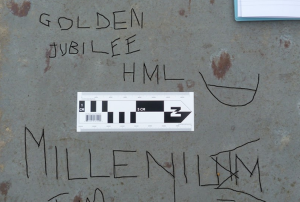 What other graffiti might be hiding underneath paint elsewhere? 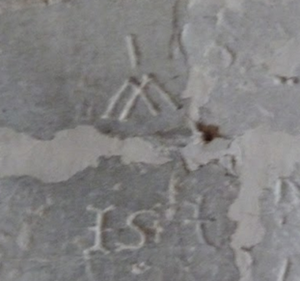 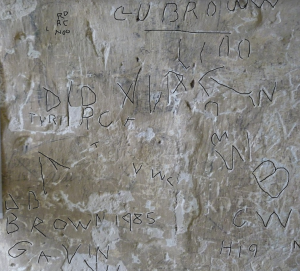 But it’s not just stonework that gets graffiti, below is what appears to be a modern – did the love between CW and MW survive as long as the graffiti? 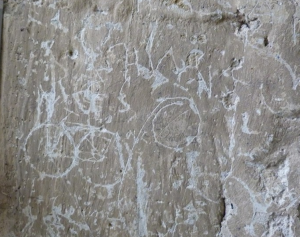 Below is a detail of just one stone, I think there are probably at least 10 pieces of graffiti, if we were able to take close-up pictures of the wall higher up we’d probably have a count in the 100s. 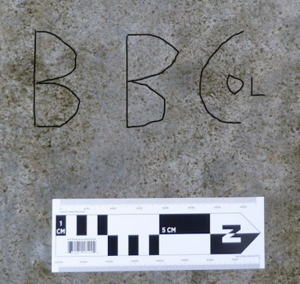 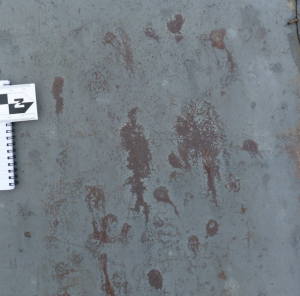 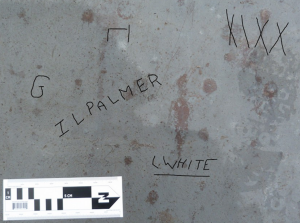 But it’s also on the roof in the lead sheeting – much of this can only be fully identified by examining high-resolution photographs close up on a large screen, then tracing over the letters. 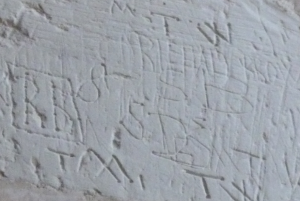 Innevitably since lead is soft the graffiti gets slowly worn down by each succeeding visitor to the roof. 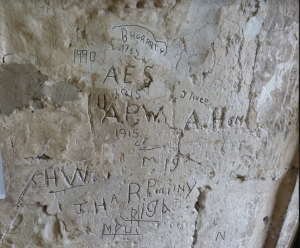 The next may have been left by my 7th cousing one removed: Fred Westall (b 1893) – did he leave it before going to war, wanting to leave some permanent mark on the world, or was it a celebration of having survived? 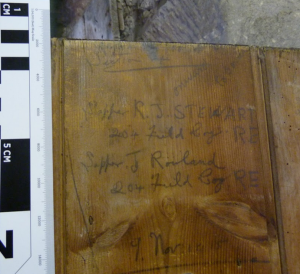 This one seems to have been interrupted part way through – the “William” is much stronger than the surname – Hatt? 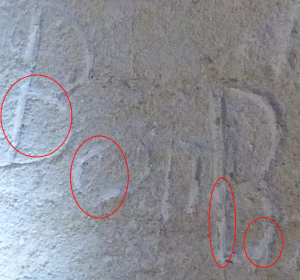 It also goes to show that the orthography of the graffiti can give clues to it’s age. 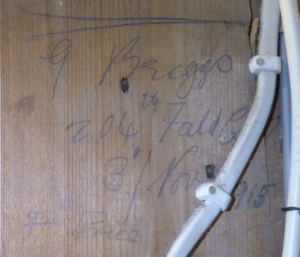 We’d be able to tell that the following piece was modern even with the handy date. 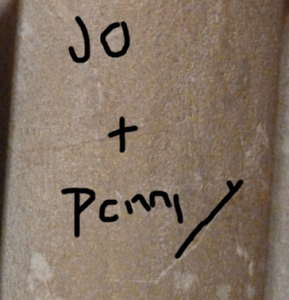 Note that it’s over a 1957 piece. 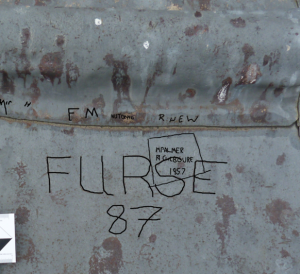 Was Furse a surname? 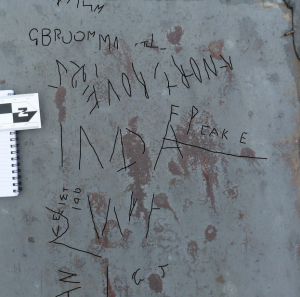 Probably the most interesting items of graffiti are graphicals ones. 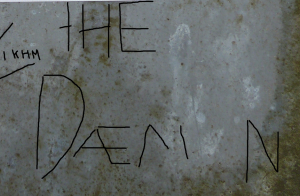 What next? 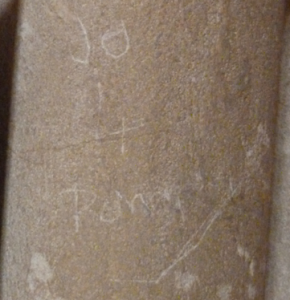 well after the meeting more graffiti was pointed out to me around the Western door and on the lead of the font, so we have more recording to do, and we need to improve the quality of some of the photos, then we’ll work with the county co-ordinator to try to understand more about the meaning. 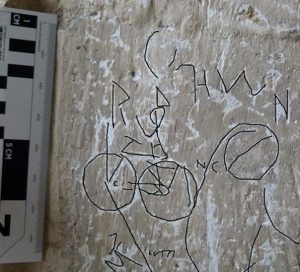 As a footnote, there was mention at the meeting of the old Mass Clock outside, it can be tricky to find, but we took this picture after the meeting. 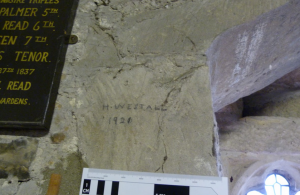 Note that it is half covered by the buttress, the buttress was added to the church after the wall was first built.